A dental supply company has agreed to pay the Environmental Protection Agency (EPA) over $300,000 for pesticide violations. Oregon-based A-dec has been selling dental water cleaner tablets called ICX since 2006. But though A-dec had applied to register the cleaner in 2006, the waterline cleaner had not been approved by the EPA. Within a month, the company had properly registered the water cleaner and was legally selling it again. A-dec insists they thought they had received EPA approval. The product had been already been fully tested and approved by the FDA. A Pennsylvania dentist has been indicted for illegally dumping waste from his dental practice. Thomas McFarland, 59, has apparently admitted to dumping medical waste from his boat. The debris (including 260 needles) washed ashore on New Jersey beaches. One beach had to be closed five times this past August. Australia is considering a proposal to fluoridate bottled water, and the Australian Dental Association supports it, noting that people are drinking less tap water. The proposal would not require manufacturers to add fluoride to bottled water, but would allow them to do so, something that was previously prohibited. In our most recent survey, we asked dentists if they are in favor of water fluoridation. 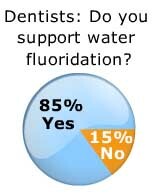 The clear majority (85%) support fluoridation, with many citing it as one of the top 10 public health innovations of the 20th century. The minority (15%) voiced concerns about the possible side effects of mass medication. “There is a reason it was rated one of the top ten health policies of the century,” said one orthodontist. “Fluoride in excess is linked to several health problems,” cautioned a prosthodontist. “It is forced medication of questionable benefit,” said another dentist.